elec calc™ EP, a design and sizing software for outdoor lighting installations, enables the creation of lighting lines with all their components (posts, cables, lights, circuit breakers, etc.). With its clear and concise interface, elec calc™ EP can quickly and effectively design outdoor lighting installations as tree lighting lines. Each element has its own detailed specifications. 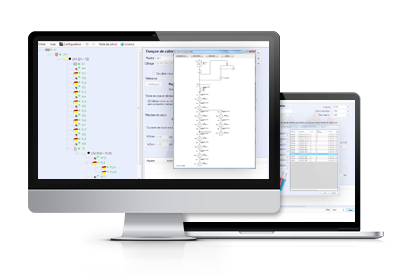 elec calc™ EP visually indicates the compliance status of the installation and provides guidance to the designer. The copy/paste feature for elements or installation parts makes it easier to input data and to improve productivity. The calculations are processed in real-time throughout the installation according to current standards for outdoor lighting, which guarantees the safety of the installation.